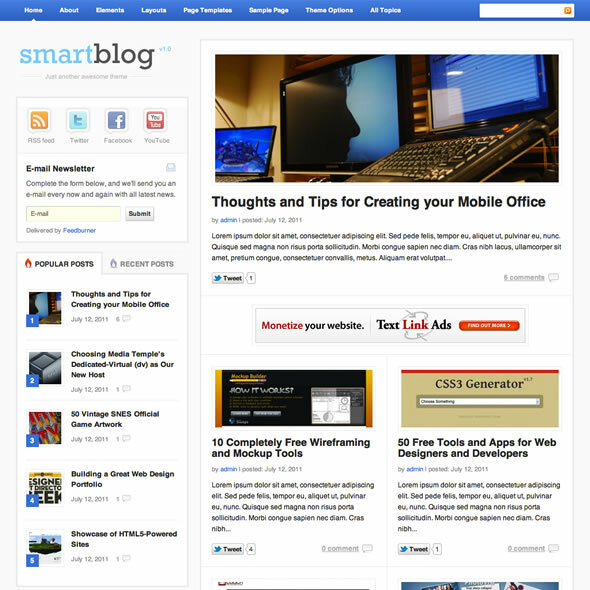 Smartblog theme from Theme Junkie is one of the best options available as far as personal blogging themes are concerned. At the first glance the theme looks attractive, if you look at the features of Smartblog theme, you will find that it is not only attractive but it comes with all the important features which a blogger may require to convert a new blog to a successful blog. Smartblog theme comes with four built in layouts to choose from, the left sidebar, right sidebar, different post size in the homepage, so you have the options to play around with the design you want for your blog. The logo is placed along the sidebar which looks really attractive, the inbuilt social icons, the recent and popular post widget completes the look of the theme and makes it a very neat and user friendly theme. Advanced Control Panel: You can easily take full control of your theme with powerful yet easy-to-use theme options panel from setting to styling. AD Management: Smartblog theme comes with easy to manage advertisement system, the position of the ad unites are also perfect to attract more users easily. Custom Widgets: Smartblog theme comes with multiple custom widgets including Twitter, Flickr, and additional custom widgets to enhance your site. Search Engine Optimized: The Smart design and XHTML valid code of Smartblog theme ensures maximum search engine visibility for your WordPress site. Lifetime Support: Another important aspect to look at while purchasing a premium theme is the kind of support provided by the theme developer, specially if you are a newbie to WordPress, you will need support from the theme developer every now & then. If you purchase Smartblog theme, Theme Junkie will provide lifetime support without any additional cost. Custom Page Templates: Smartblog theme come packaged with multiple pages templates including Archives, Full Width, and additional custom templates to enhance your site. Conclusion: Undoubtedly, one of the best options available for blogging themes, the simplicity and neat layout of Smartblog theme can easily attract any user. Another good news is, you get this theme and other 39 theme just for $50 which is amazing & Theme Junkie is around for long time and has been a trusted source as far as premium WordPress theme are concerned.